We are so proud of the #7c racing team! What a great season! There were over 260 teams throughout the nation that came to square off for the 2012 26th Annual Lucas Oil Chili Bowl Nationals at the QuikTrip Center’s Tulsa Expo Speedway. The field represented the best of the best. There were teams from thirty-one states, one from Canada, one from Australia, two from New Zealand and one from Finland. The races ran from Tuesday through Saturday and provided hard nose action for all. 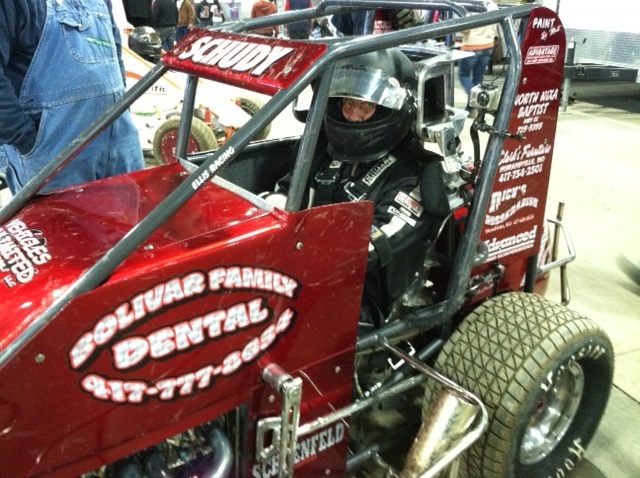 Driver Pat Schudy and team were there to race the #7c car. Monday, during the practice session, the car ran well as Pat established a feel for the track. Wednesday during hot laps the car would not turn so the team vigorously worked on the set up prior to the C-main. During the C-main, Pat started 9th and finished 6th. After the race it was obvious that the car needed some changes on its setup prior to the next race which was Saturday. The team put their heads together and tuned the car with hopes that the adjustments would help Pat drive the car easier and allow the car to handle the track better. Hot laps went well on Saturday and the excitement grew as Pat took to the track for the first I-qualifier. The #7c car starting 7th ran great as Pat battled the field and ended with a hard fought 2nd place finish. Emotions were high for the team, but as Pat came off the track we learned that the car had been disqualified because the muffler came off during the race. Even though the race ended with a major disappointment, the car was hooking up better than ever, the team and car were injury free and we are looking forward to the 2012 race season. We will keep you up to date on the upcoming 2012 race season schedule for the #7c race team.